I’m a fan of yearbooks. I was an editor of mine in college, a somewhat unusual, multi-volume, and boxed object that included two books, a booklet, a brochure, and (it being the late sixties) a balloon. Back then, we thought we’d made something cool that would last forever. My copy still exists—I just came across it in the basement—but when I checked online today to see if I could locate another one, all I could turn up was one volume from the set, its orange cover (it being designed in the late sixties) lightly soiled, a little crooked, and showing some wear at the extremities. The same thing can probably today about the now-aging baby boomers so prominently pictured in the second volume, the one that seems to have slipped away. In recent years, it turns out, the production of yearbooks has dropped precipitously. 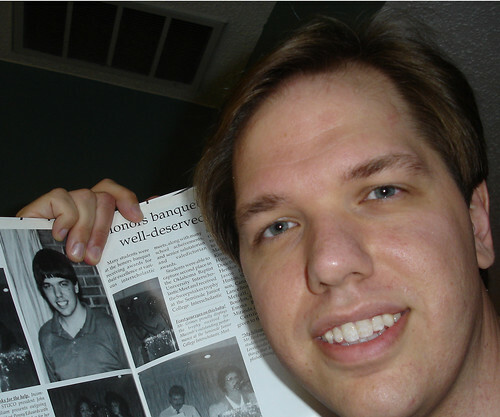 An online piece by the Associated College Press in 2004 describes how Florida State University, tried to resurrect publication of its yearbook, The Renegade, by taking part in what then looked like an innovative program (see their 1987-1988 video yearbook above). After budget cuts at the school precluded the administration’s funding the yearbook, Dallas-based Taylor Publishing, one of the five big yearbook producing companies, not only fronted printing and distribution costs, but even gave FSU $15,000 to hire a yearbook adviser and editor, design the book, and cover other miscellaneous costs along the way. Taylor figured they’d keep 90% of profits, give the school the remaining 10% and everyone would walk away happy. Who knows how that deal worked out, but just four years later, online reports of the demise of yearbooks had become commonplace. A 2008 story for The Economist reports on print runs nose-diving, and yearbooks being dropped altogether, for a number of reasons including high prices, huge hikes in tuition fees, and the fact that social networking sites now presented students with more interesting, accurate, and cost-free ways to represent themselves and their shared experience. As one college biology major at the University of Texas questioned by a reporter for ABC News put it, "I feel that paying $85 to have a book with pictures of people you don't know in it is kind of an undesired product for most students." As Shannon Perich, curator of Photography at the National Museum of American History, writes in her piece for click! photography changes everything, even in the 19th century, there were college graduates eager to create interactive and one-of-a-kind photographic representations of their higher education. Click here to read her story about a photographic entrepreneur and a Civil War era artifact that speaks about photography and memory, but even more poignantly about friendship, love of country, loss, and a unique artifact that survived to tell multiple tales.